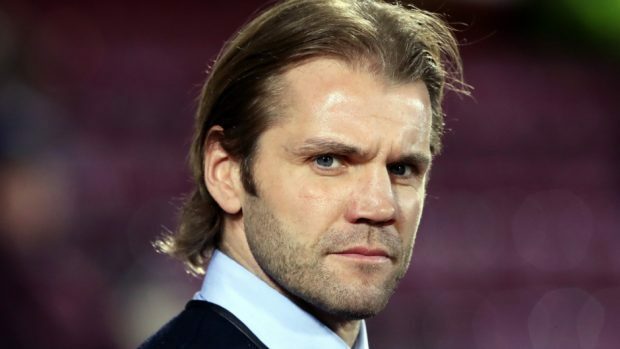 Robbie Neilson is in charge at Dundee United. Caley Thistle boss John Robertson observed Robbie Neilson’s first steps in management from close quarters and he believes Dundee United’s players will be left in no doubt about what he expects at Tannadice. Neilson began his managerial career at Hearts in 2014, when the Jambos’ all-time leading scorer Robertson was in an ambassadorial role at Tynecastle. Although a move to MK Dons in 2016 did not prove successful, Neilson was earlier this month tasked with succeeding Csaba Laszlo at United, getting his reign off to a winning start with a 2-1 victory over Partick Thistle last weekend. Robertson will come up against Neilson in the dugout for the first time when Inverness make the trip to Tayside tomorrow, and the Caley Jags boss feels the 38-year-old will make his squad fully aware of the club’s need to achieve promotion this season. Robertson said: “Robbie is a very good, knowledgeable young manager. He’s the new breed, so head coach is probably a better description. “I saw him at Hearts, they would train every Friday down at the stadium and I could see what Robbie’s thoughts were, and how he prepared his team. “He’s very meticulous, very organised and demands high standards. He will get his ideas across very well. “He knows the high standards he wants to achieve, and the Dundee United players will realise that very quickly. “I think it’s a perfect fit. He has been very patient in that he had a criteria of what he wanted from a job – he wanted a team with a big fanbase, training facilities, a good squad and good budget. I think that’s what he’s got at United. “He’s a young manager who has already won the Championship not too long ago. Despite the fact he had a tough time of it at MK Dons he will be better for that experience. “Robbie’s main strength is he’s a terrific coach who gets his ideas over very well. But he wouldn’t have been allowed to do that at MK Dons, because such is the English system they are playing every Saturday and Tuesday. “With the modern player, that’s three games a week, with three games recovery. There’s very little chance to do much coaching. Neilson’s appointment at Tannadice was quickly followed by Gary Caldwell’s arrival at Partick Thistle, however Robertson is relaxed about the impact the changes will have on his own side’s prospects, adding: “It doesn’t make the league any harder per se, as the managers who have left were good managers. That’s why they were there in the first place. “At the end of the day it’s what you get out of your players on a Saturday.